Ep.6: The annual Merge-time Power Rankings! 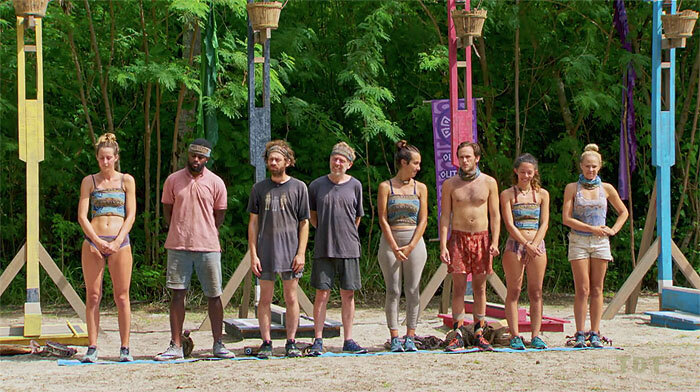 There was a scene in this week’s episode, a scene that basically explained why modern-day Survivor players feel like they have to make Big Moves™. I believe it was right around the reward challenge and Gabby was telling both Kara and Alison, and then us at home in a confessional, about why she needed to eliminate Christian. Essentially, she argued, Christian, with his glasses, funny walk and all-around nerdiness was getting credit for moves she felt belonged to both of them. She needed to show the jury that she was also playing the game. In the world of public relations research, a lot of scholars study something called crisis communication. Essentially, when an individual or company finds itself in a really bad position, there are strategies they can exact, strategies meant to navigate them through that crisis. This is not just reactionary, but a plan of action implemented to mitigate damage and set the individual or organization on a path toward revitalization. The theory posits two things: that communication is something people do with a goal in mind (this could be a big or small goal); and that maintaining a good image or reputation is a main goal of a person and a person’s communication. Research uncovered five main types of image restoration strategies: denial, evading responsibility, reducing offensiveness of the issue, owning up to everything and, finally, corrective action. We see all of those things in Survivor when someone’s reputation takes a hit. 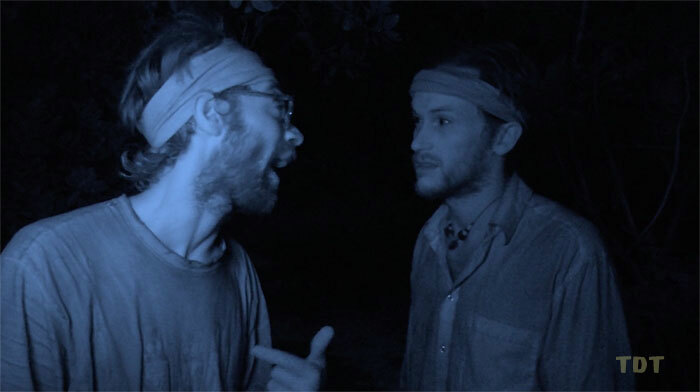 Heck, just this week we saw Christian basically own up to the Carl vote to Nick. But Gabby knew, quite clearly, what her image needed and therefore she tried to utilize corrective action. In her mind, making a Big Move™, mostly by herself that she’s leading, would effectively repair her image in the eyes of the jury. We know, through what happens in the world all the time, there are things that just can’t be overcome. But I think Gabby made a hell of a move here. If Davie didn’t blow it up, Gabby not only removes the biggest threat of the game, she can talk at final tribal about that move and the moves she and Christian made together. Unfortunately, it didn’t work. I think it’s important, though, to understand how every season players try to restore their image and always use one of those five strategies. And sometimes it doesn’t work, but in the case of Gabby, it was still the right move at, dare I say it, the right time. 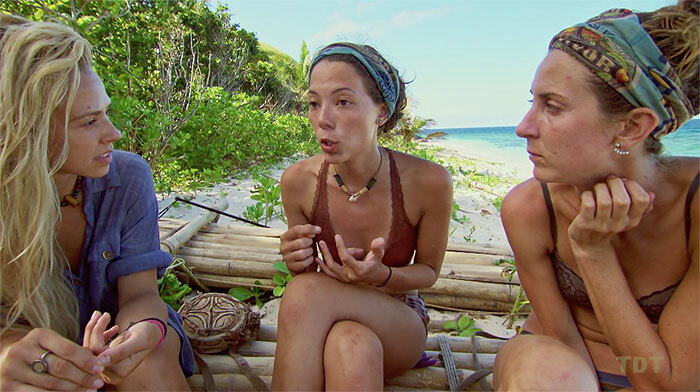 Angelina: Man, I know many people are saying that any of the remaining players can win, but did you see Alison’s reaction after Angelina boasted to her mom about giving up her chance at immunity? Let’s just say that reaction makes me believe she cannot win. Also, what is the big deal about her giving up a chance at immunity? I don’t say this in a bad way since I’m sure I’d be similar, but she had no shot at winning it. It’s not like she actually gave up immunity. Mike: Is there any doubt at all Mike makes the finale? He might even be sitting at the end. He won’t, though, be winning. I’ve said it since the beginning and I’ll continue saying it: Just like John, Mike is famous and relatively rich and, because of that, nobody is giving him another million. Plus, Mike’s played a weird game. He’s been in the middle of basically everything, but it doesn’t seem like he owns any moves he can point to as his. It’s weird. Davie: I really liked Davie’s move this week. As a fan, I appreciate his understanding of how he needs Christian. As a viewer, I do wish Christian went home only because we all know he wins if he makes the end and I’d rather more of an element of surprise. Davie finding the newly hidden idol would be huge, I think. Go Davie, take it home for the Ferrucci Fantasy Team. Nick: Previews for next week show how, for the first time, others might start looking at Nick as a threat. About time. Nick is still playing a hell of a game and I have a feeling secret scenes will tell us Nick was totally aware of Mike and Angelina voting for Gabby. The big thing with Nick, if he gets to the end, is can he effectively articulate everything he’s accomplished on the island, since it seems like he’s played a really quiet game … even if he has played the opposite. Alison: I’m going to repeat what I wrote last week: What’s with this Alison is a big threat stuff? We haven’t seen her dominate or anything in challenges. We haven’t seen her lead literally any strategy. We’ve seen her be a follower on votes and we’ve seen her talk a lot about moves she doesn’t eventually make. I’m not saying she’s playing a bad game or anything, I just don’t understand why she’s more of a threat than, say, Kara. Christian: There is no doubt in my little mind that Christian owns the longest odds for getting to the end. But there is also no doubt in my little mind that Christian owns the best odds for winning if he gets to the end. But he’s also a challenge beast and found an idol once before. It’ll be fun to watch Christian try to make it. But, if he doesn’t, you know we’ll see Christian again. OK, only two more episodes left. I can’t wait. If these next couple episodes are as good as the rest of the season, we can call David vs. Goliath a top-five season.